← If Only Toby Could See My Fairy Gardens! Last Monday, the Columbus Maennerchor auctioned its stained-glass windows, antique beer steins, two bars, brass chandeliers, door transoms, fireplace mantels, art-glass hanging lamps, restaurant paraphernalia and other memorabilia from the club’s 163-year history. The German club’s current home will be torn down, so it’s moving to much smaller quarters next door. Since all these vintage treasures can’t fit, the club decided to sell them to help fund this new chapter in its history. Growing up in German Village, I loved going to the Maennerchor. Descended from Germans who have lived in Columbus since the 1830s, I learned about my Teutonic heritage from many of those items that hit the auction block last week. Ever since reading about the auction, I’ve been thinking about the Maennerchor and saying “Auf Wiedersehen” to these artifacts of my childhood. While I was sad to read about the auction in general, I was particularly sorry to read that two of my favorite Maennerchor fixtures were being sold: the musical-clef handrail and the pull-knob cigarette machine. 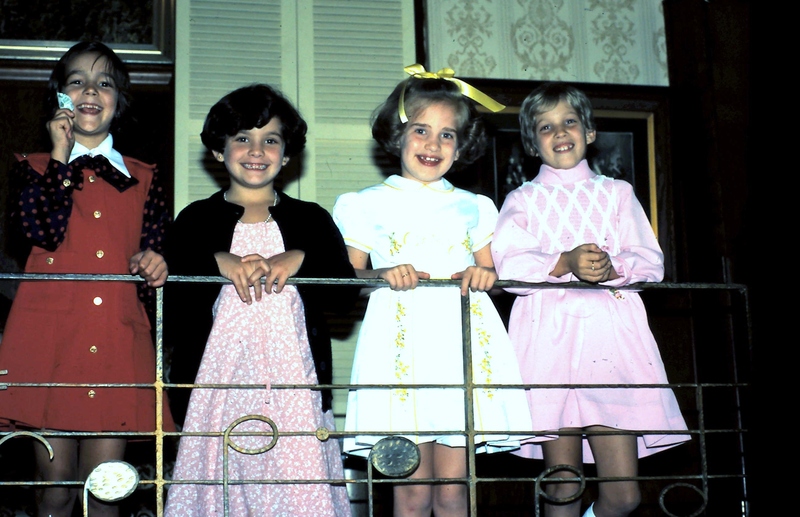 The handrail was a constant element in photos taken of me and my friends during my birthday parties at the Maennerchor, right after we shared a German chocolate cake with a sparkler on top. The cigarette machine was something fascinating to look at en route to play in the telephone room upstairs, where even the walls were carpeted. The first great part of the Maennerchor greeted me right away: the doorman. His stash of Dum Dum pops in the top drawer of his desk got my visit off to a fine start (in the photo above, Christy pretended a Dum Dum wrapper was a puppet during most of that birthday party). I was in my element downstairs in the Rathskeller. On my way down the stairs, I always took a curious glance at the electrified chair lift and hoped I would see it in action. Walter the host always showed us to a table where we could catch up with German-born Melitta, our favorite waitress. While Nails treated himself to the fried pickerel, I not only developed my fondness for schnitzel and sauerbraten, but also learned some German words by reading the phrases that were incorporated into the folk paintings on the walls. I can still taste the Maennerchor’s fried chicken, mashed potatoes and dressing. Walking through the smoky Bier Stube proved to be scary long into adulthood, but once I got my Shirley Temple, arrived at the Konzert Hall and saw the elegant brass chandeliers and black-and-white tiled floor, I was ready to practice dancing with Nails under the sparkly mirrored disco ball. On Saturday mornings, I practiced singing with the Kinderchor, carefully following Mr. Rathburn’s directions and being entertained by Mowgli and Tigger. 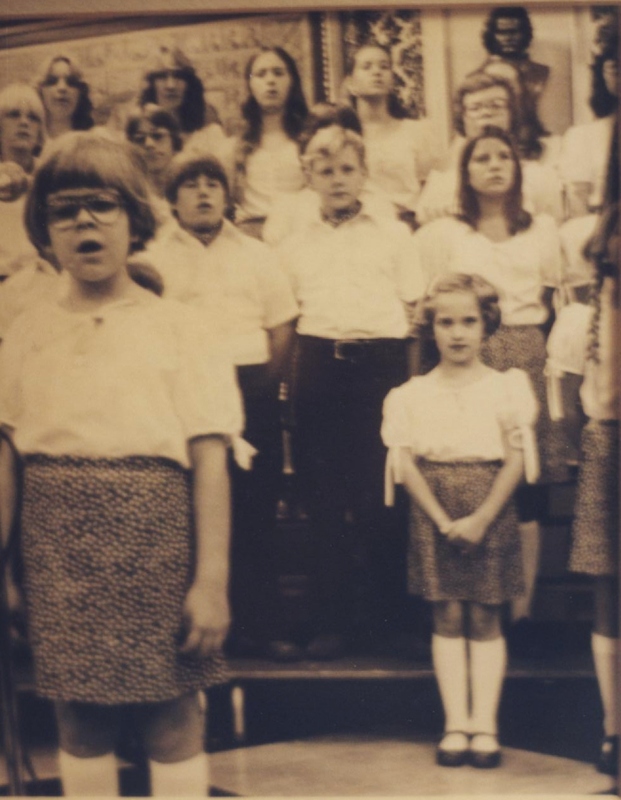 As one of the youngest, smallest members of the choir, I stood in the front row, which was a perfect place to enjoy Stephanie’s solos in our rendition of “Heidschi Bumbeidschi.” Stephanie, Mindy, the Martin siblings, Eric, and my other Kinderchor friends all took turns working in the coat room, where the tips we earned benefited the choir. When winter coats got too heavy for us to handle, our mothers were on hand to help. One Christmas, we all received an angel ornament that a Kinderchor mother made for us out of pearl and gold beads. It still decorates a coveted place on my tree. 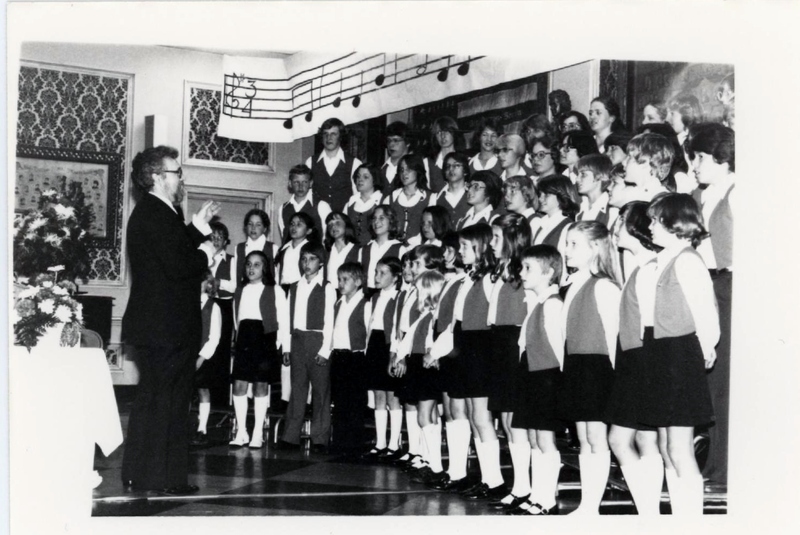 When I was 26, I joined the Damenchor for a couple of years, which gave me the opportunity to get to know the mothers of my Kinderchor friends. However, it just couldn’t top the Kinderchor. We don’t belong to the Maennerchor anymore. That’s almost as unfortunate a tale as last week’s auction. I hope the Maennerchor’s treasures have gone to good homes. This entry was posted in Columbus, Germany, Miscellanea, Music. Bookmark the permalink. How sad that these treasures were sold. You have such delightful childhood memories. Thank you for sharing them. My wife Theresa and I were at the auction and were able to buy a couple items. The club was in rough shape, probably from lack of maintenance due to the money problems. It almost broke my heart. Terry was a member of the original Kinderchor as Theresa Nentwich. Her father, Tom was a Board member for many years and we both were glad that he passed a number of years ago and didn’t have to see this. He and Betty, (Terry’s mom) love the Maennerchor. I sang with the club for a few years in the early 8o’s but my schedule didn’t allow me to continue. I wish the club good luck in their new home.